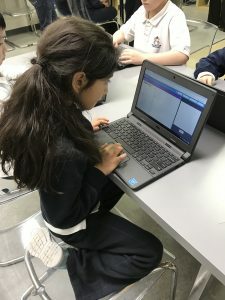 Grade 2 student learning to code. Beginning in Lower Elementary, our students use technology in the form of practical life. Students use classroom computers to supplement their curriculum in a purposeful, meaningful way – not as a substitute for books and other materials. Students learn typing skills, how to use a word document and spreadsheet, how to submit a paper via email or Google Docs, how to research reliable and helpful information using a search engine and how to put together a persuasive presentation. In January 2017, we introduced an after-school coding program for students ages 7+.